In recent years hundreds of us have enthusiastically welcomed the Austrian scythe on to our small holdings, gardens and nature reserves. We have discovered how this scythe really is a most efficient and practical tool, and is a joy to use. This scythe revival in Britain has re-equipped people to be able to tackle those small to modest mowing tasks in meadows an grasslands which were formerly a bit of a problem. So it is that questions arise as to why many have found the English scythe difficult to use, and why it has largely become a bygone curiosity relegated to being an ornament on pub walls. Is it the knowledge of its use we have lost, or does the tool itself now fail us in some way? Why if the Austrian scythe is so much easier to use has it not been imported and widely established in use in Britain before, if only alongside traditional tools? It is not as if the English scythe was a rather simple and basic tool. 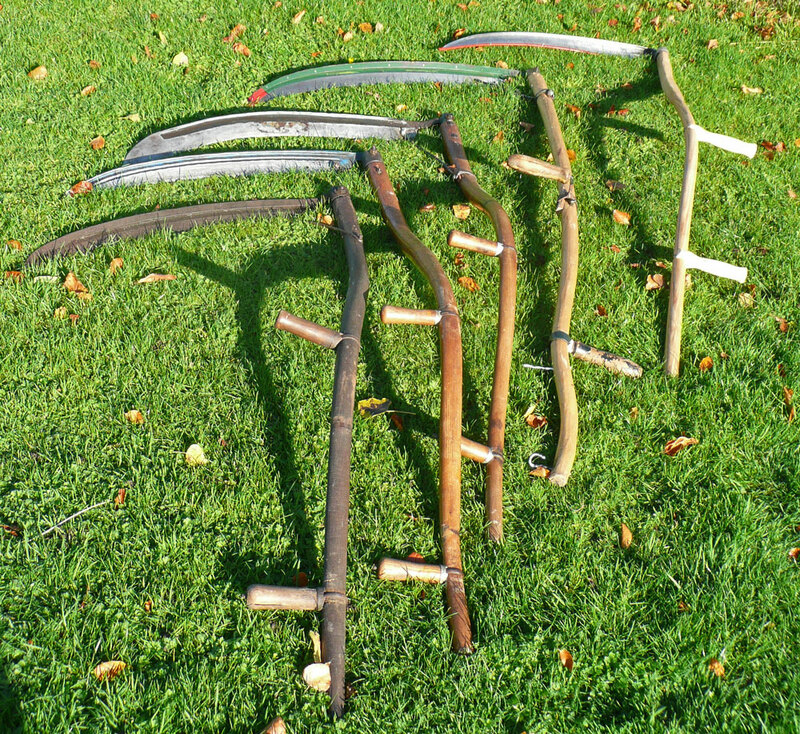 The English scythe was like its Austrian cousin the product of centuries of development and use. The English scythe tradition includes more than familiar S-curved snath with stamped riveted blade. There were a variety of forms and variations in both snath and blade as illustrated by this Tyzack catalogue excerpt. English Scythes were exported worldwide and were the main form adopted in the USA (before Austrian scythes found their way there in recent times). Logically one has to presume that the English scythe was fit for purpose to have been used so extensively and unchallenged by the alternative European scythe tradition for so long. And surely there must have been a basis for this other than just tradition and prejudice? A number of SABI scythers are now re-visiting the English scythe to explore what it is really capable of. Mark Allery for example has reverted to using the English Scythe as it is more in keeping for the talks and courses he gives at the Weald and Downland Museum. A number of us got together during this year’s Scything weekend at Wimpole Hall to compare notes. We were pleased to be joined by Chris Earle veteran of the English scythe tradition, who was able to give us a few useful pointers. We also used the 5 x 5 m mowing competition to compare English scythe vs Austrian performance. The results of this meeting can be seen in the following video. In spite of all this investigation, the answers to the key questions seem to remain largely a matter of conjecture. My current personal theory is that the two divergent styles evolved for different circumstances. The heavier English scythe is harder work. The extra weight gives extra momentum which many believe may help to keep the blade moving through the thick lush grass we have in our damp Atlantic climate. However in my experience this does require extra horsepower from the mower. This could fit with the English tradition of larger farms on which mowing would be organised to make use of the strongest (high Kw) males available (often hired travelling mowing gangs). The other men women and children in the local community would do the rest of the hay making and carting done (which requires at least 5 workers for every mower). By contrast in Continental Europe mowing was not as segregated. Individuals and communities were more likely to have to mow their own grass. In this circumstance a more refined scythe design which could be used efficiently by individuals, both men and women, of varying strength (Kw) would be preferred. If true this could explain why the Austrian scythe is a better match for current situation in the UK where travelling gangs of super-fit mowers are not available and many of us spend more time on computers than in physical work so do not have the power output needed for an English scythe. Against this however we have yet to find anyone who can mow as well with an English scythe as an Austrian one (not even Simon Damant!). Two other factors often discussed. Firstly that the English scythes may have been developed simply because they were easier and cheaper to produce in factories, and for a less demanding UK market largely turning over to mechanised farming. Secondly, many like me failed trying to use our grandfather’s scythe just because they were made for previous generations who were shorter on average. Essentially all scythes are designed to perform the same task. The design may change but the underlying geometry to ergonomically fit the user is the same. 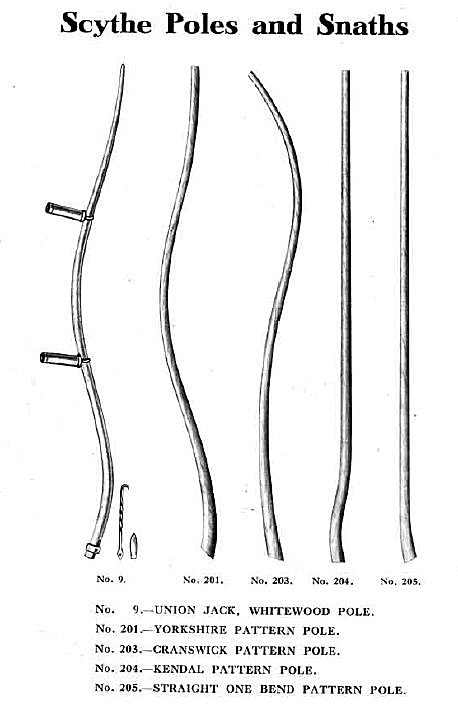 I believe there is some potential for further scythe evolution: lightweight snaths in the English style incorporating some of the features of the Austrian pattern to make it compatible with today’s requirements. Something I have begun experimenting with …and to be continued next season! This entry was posted in Scythe Festivals and Events, Scythe history. Bookmark the permalink. Thanks for the article. I see old photos of Australian farmers dropping acres of oats with the old English snaths, and figured they must have been made of pretty formidable stuff compared with the tractor-dependent farmers around these days (thinner too). My 10 year-old son is really taken with the English-style snath, despite the fact that I sell the Canadian, Swiss-style snaths in Tasmania (“Bladerunners”). I’m not certain he doesn’t just like a challenge, but I suspect he simply loves the shape and wants to master the tool (he has a lot of muscle-development years ahead of him, so I’m not going to talk him out of it). The one he’s been using has finally broken the hafting collar, and needs a replacement. The scythe is becoming a very popular tool, not only for mowers, but for people who want to hang them above the fireplace in the lounge room, so the price of these tools 2nd hand are getting up around the price of a new Swiss-style. Is anyone manufacturing these snaths new? Hi, I mentioned to my wife that when I lived in northern England and during the 40’s I remember farmers using scythes and stacking the (wheat/hay) in little wigwam like sheaves. I live in Australia and my Australian wife thinks I’m dreaming……… am I right? Don’t forget that the stamped and rivetted blade was a comparitively late innovation. English scythes previously, and some after, had forged blades, but of a harder steel than the Alpine and needed grinding to prepare the edge. I’ve only just read this. We played with making English style snaiths in my workshop @ Brookhouse Wood, and Owen Thomas used one of these for some telly thing, I think. JoJo Wood helped me make one on a demo at The Scythe Fair, June 2013 but for this we used adapted chair-making jigs. Mark Allery and I played together on the project at an APT gathering. Maybe we’ll give it ago at the Bodgers’ Ball May 2016. I always use a lightweight cleft-wood English snaith with an Austrian blade whenever clearing pathways. Hi Mike, thanks for looking. Yes I remember your snath demo at the scythe fair. Mark has continued bending snaths at subsequent scythe festivals, and in between. I have also continued experimenting with steam bending snaths myself, trying different designs, but also having to learn about steam bending techniques as I go. We have been talking locally about organising a SABI/APT visit to the East Anglian Museum of Rural life at Stowmarket who have in their collection snath making tools and jigs from the Whelnetham Woodwork company.